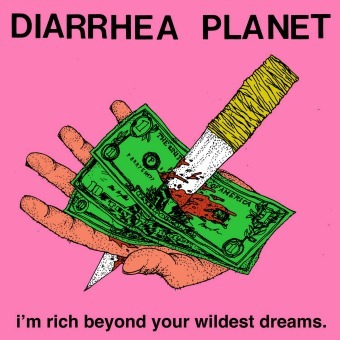 Repping the burgeoning Nashville under-the-rock scene, (read Not Country, with fellow travelers including Jeff The Brotherhood and Pujol), is the one and only Diarrhea Planet. Just the name alone brings either automatic cringes or hearty right-ons, and you can file us firmly in the latter camp. To see these guys live is to truly love them, but they are certainly stepping up their game on the recorded front. I’m Rich Beyond Your Wildest Dreams is a quantum leap sonically from their previous, Loose Jewels. Maintaining the unironic love of a life that was saved by rock ‘n’ roll, Diarrhea Planet gives you every reason to knock them down on paper, from That Name to the over the top three, or more, guitar lineup that trainwrecks 70s rock onto pure punk energy. How it works is a magic trick that only they know, but somehow they escape Southern Rock cliches and at their best, (“Kids”, “White Girls”), end up with the burnished beauty of Thin Lizzy. Finishing on a high note, if you’re not singing along with the chorus of “Emmett’s Vision”: “What the hell am I/Doing with my life…”, you’re in a far, far better place than me.